I'm about to go ham sandwich on this episode. This week starts off with the girls finding out that they are going to the tropical WHITEFISH, MONTANA. Or as the natives call it the Bahamas of the West. Last year you were going to Croatia (which I now know is NOT in Spain), London, and Bermuda. Don't get me wrong. It's looked really pretty. I just want spicier locations. The first date was with Lindsey. He took her on a plane (whatttttt?) and then landed in some field where they made out. I don't know about you but I get nervous sitting in grass. I'm convinced I'm on an ant hill and ruining every small underground creatures life. I watched "A Bug's Life," a lot as a child and it has stuck with me. Also did anyone else notice her say, "When I was an adolescent..." when talking about her life? This isn't "Downton Abbey" girl...you can say "when I was a teenager..." We won't think less of you. Perhaps she's just trying to look regal considering she did show up in a wedding dress the first episode. 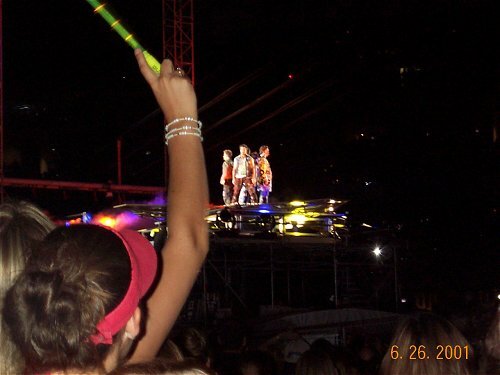 They then danced on an elevated platform in front of people during a concert...AGAIN. Listen folks, the only people I wanna see dancing on an elevated platform are Justin, JC, Joey, Chris, and Lance. They're part of the all male super group *NSYNC? Not two people making out. To be honest she does seem like a nice girl overall so I'm glad she's sticking around a little bit. Then there was the group date. In the hills of Montana. The girls participated in what my internet frang, Allie described as very "Double Dare"-esque. I don't know why Sean is insisting these girls prove they could survive on the Oregon Trail. Pretty soon they're going to be near a Cornucopia fighting for their essential materials (press on nails, hair spray, a bowl of 4 Doritos if you're Tierra). I'll literally turn anything into a "Hunger Games" reference. Winner stays, Losers hit the bricks. Sarah, ONE-der Woman, didn't complain at all. "I'm scared of this challenge because goats fear me. Because I have one arm." She hauled hay, and wasn't a downer at all. Actually she was pretty cool. Des ended up chugging the goat's milk and her team won. It was time for the other girls to hit the hay back at the hotel. However, once at dinner, Sean dropped a BOMBSHELL. The losing team was coming back! The winning team was PISSED. -Survive a boat sinking in the middle of the ocean. Thus I find their accomplishments to be pretty lame in comparison. The girls came back and everyone was icy. Especially Ke$ha, who seemed to take it pretty hard when she walked in on Catherine sitting on Sean's lap. Which I had a whole other issue with. You know what's worse than getting offered a guy's jacket? HAVING THAT GUY ASK TO SIT ON HIS LAP. She started weeping and Sean felt sorry for her and gave her the rose. The women were furious because not only did they not care she was upset but she was on the losing team and still got a rose. At some point in the night it was revealed that the 2:1 date was going to be between Tierra and Jackie. Tierra was fine with it and knew she was going to be safe. However, she said that she wanted to make sure she had the advantage and broke out of their holding cell hotel room out to see Sean. He was "happy" to see her and no one ended up knowing she was there. How the f did she escape from the hotel? Why did no one stop her? Does this literally mean there are no rules now? The next day brought on another pioneer adventure. Jackie, Sean, and Tierra took a horseback ride to another hill and chit chatted all day. Sean tried to get Jackie to dish on Tierra, and she kind of caved. He made out with her and then they went to dinner. Let me tell you about this dinner. No one was talking and you could audibly hear them swallowing their drinks. I was cackling in my apartment. followed by "So listen I'm sending you home...let me walk you out." Didn't want to send her home on an empty stomach. Traveling from Montana takes what 4 to 7 days? As Jackie's limo rolled out, fireworks went off in the rear view. The next day Tierra continued to complain about being "threatened." She also stated that, "She came all the way to Montana...and it wasn't FAIR to her to be treated so terribly." I would like to point out that everyone came to Montana. It wasn't a special sacrifice she made. I also never heard one of the women threaten her. "Sean's nice and all, and I like him, but I don't need this. I can go get engaged to any time I want." This is about when my eyes popped out of my head and steam came out of my ears. THEN WHY AREN'T YOU ENGAGED YET YOU SOUL SUCKING BOOGER FACE? Sean walked by right as she decided to hulk out. He then pulled Lesley aside and tried to get her to give him the details but she didn't. I think that has a lot to do with the fact that everyone who snitches on Tierra gets sent home. I was yelling at my TV. SHE LITERALLY SAID: "I COULD GET ENGAGED TO ANYONE." HE WOULD HAVE SENT HER HOME. Sean then pulled her aside and she gave him some sob story about how her ex-boyfriend was her best friend who died because he was an addict and she has problems giving herself to people because of her dead best friend boyfriend. That's weird don't you think? All of a sudden five weeks in we're learning about her dead boyfriend? Girls drop those facts the second they step out of the limo. Sean was also frustrated because he didn't feel like he knew if his wife was in the room anymore and I have to say I agree. No one seems to care about him...they all seem to care about making him see why Tierra is Satan. If Tierra makes it much further, which is seems like she does via the preview of the rest of the season, I'm going to stroke out. There's not anything good about her. At least Courtney was good at being evil. Courtney never cried to Ben about how she was being abused by the other women. She just poured Visine in their food and called it a day. If you're going to be a villain at least be good at it. I never thought I'd say this but...I miss Courtney. Loves it. Thanks for the shout-out, internet frangggggggg(-a-lang-a-ding-dong). Can't wait for part deux. Also, please enjoy this little video as a reminder of how awesome last night's ep. was. Okay, so I think you're absolutely hilarious. I don't even watch the Bachelor, but I can't wait for Tuesdays when you re-cap it! Seriously, I love your blog so much that I went through and read all your old blog posts in like three days (Was that creepy? I didn't mean it to sound creepy.) Oh, and I live about 8 miles away from where they filmed this week's episode. I'm totally going to start calling our part of the state "The Bahamas of the West"! When I read that I started laughing so hard I'm pretty sure I freaked out my roomie. Thank you again for being so fantabulous! I didn't! However, sometimes if you're reading it on a mobile device there is some pretty trife script that shows up. Let me see if it's not coming through though! Thanks for the heads up! Oh my gosh, I'm just catching up on your most recent recaps and I can't handle the hilariousness...seriously, I cry every time. I love your commentary about the hay bale races. So.funny.